Soft and pliable rectangular cord material of expanded Fluolion® PTFE, with a self-adhesive backing to aid installation. • Forms ‘instant’ gaskets very economically. • Conforms readily to irregular surfaces. 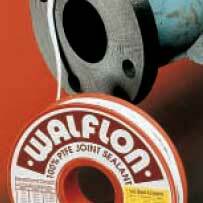 • Under load, a ring of Walflon in a flange joint compresses to a highdensity gasket. • Can be used with a very wide range of fluid media.